The Cherries had lost 11 of their previous 14 matches in all competitions, but after a goalless first half, Wilson met Ryan Fraser's deflected cross to half-volley home a fine opener (53) at the Vitality Stadium. West Ham were caught once more on the counter-attack in the first minute of stoppage time as King met David Brooks' low cross to fire in his sixth league goal of the season. 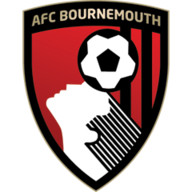 Bournemouth: Boruc (6), Clyne (7), Smith (6), Ake (7), Cook (6), Lerma (6), Gosling (6), Brooks (7), Fraser (7), King (7), Wilson (8). Subs: Mousset (n/a), Daniels (n/a), Stanislas (6). West Ham: Fabianski (7), Cresswell (6), Zabaleta (7), Diop (7), Ogbonna (7), Rice (6), Noble (6), Nasri (6), Anderson (7), Antonio (6), Carroll (5). Subs: Snodgrass (5), Hernandez (5), Diangana (5). The result keeps Bournemouth in 12th, but they move three points off seventh, while West Ham dropped a place to 10th after Wolves' thrilling 4-3 win over Leicester. There had been 28 goals in the seven previous Premier League encounters - an average of four per game - but there was not a shot on target in a cagey opening 45 minutes. Bournemouth's best chance fell to Brooks, who met Wilson's deep cross but headed wide at the far post from an acute angle. Referee Simon Hooper correctly ruled out a Nathan Ake header from a Fraser cross with Wilson standing in an offside position and clearly interfering with play. Bournemouth welcomed back their talisman Callum Wilson as he replaced Junior Stanislas, but the bigger news was that Artur Boruc started in goal in place of Asmir Begovic. Marko Arnautovic was absent from West Ham's 18-man squad. Andy Carroll started in the one change from the side that beat Arsenal last weekend. West Ham grew into the game and had their best opportunity after 25 minutes when Samir Nasri dragged a shot wide - but the contest came alive after the break as after Lukasz Fabianski produced a fine save to keep out Steve Cook's header, Andy Carroll missed a glorious chance to break the deadlock. 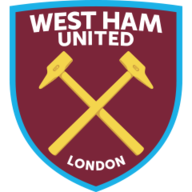 Mark Noble's cross was initially headed back across goal by the striker, but after Ake failed to clear under pressure from Michail Antonio, Carroll inexplicably scooped his shot from two yards over the crossbar. The miss proved costly as moments later, Issa Diop failed to prevent Fraser from getting his cross away down the left, and with the ball spinning off the French defender to Wilson on the edge of the box, the returning striker lashed his volley past a static Fabianski. The goal was Wilson's sixth in as many games against the Hammers, and he very nearly doubled Bournemouth's lead when his shot from King's pass struck the foot of Fabianski's post, via the fingertips of the Poland keeper. It was not until after his withdrawal with a suspected knee injury that Bournemouth put the contest to bed. With West Ham stretched at the back as they went in search of an equaliser, the hosts broke down the right with Brooks, and the Wales international unselfishly set up King to secure a vital three points. Eddie Howe: "It means everything. It's such a tough league we're in and we're competing with the very best teams in the country. You can go through all sorts of moments in a season, and we've been on a really tough run. "The players have been questioned, but I thought they came through with flying colours today. I thought it was really disciplined display full of hard work and I think we deserved the win. 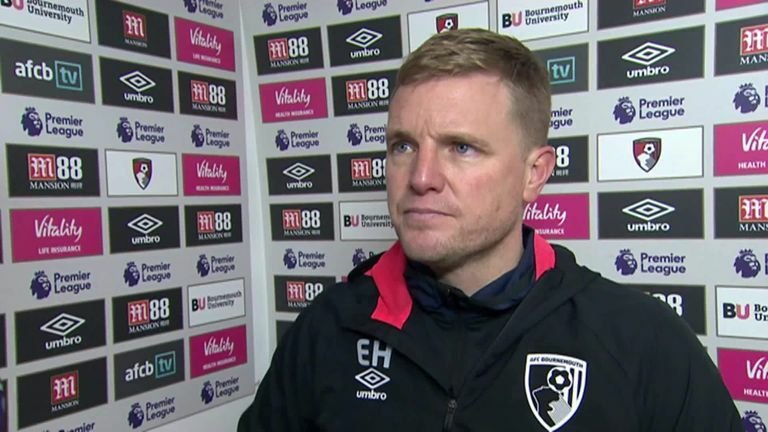 Eddie Howe says Bournemouth's hard work focusing on defence paid off as they kept a clean sheet in their win over West Ham. Manuel Pellegrini: "Of course, I'm disappointed with the result because it was a very close game in the opening 45 minutes. In the second-half we had a clear option to score the first goal. 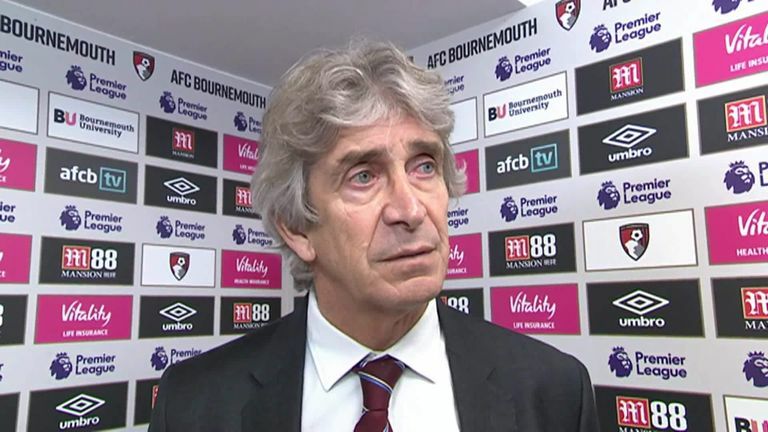 Manuel Pellegrini says West Ham played well but just couldn't score in their defeat to Bournemouth. Bournemouth have enjoyed four Premier League wins against West Ham; against no other side have they registered more victories. West Ham failed to score for the first time in their 13 meetings with Bournemouth in all competitions. Bournemouth ended a run of four Premier League games without a win (D1 L3), keeping only their second clean sheet in their last 13 games in the competition. The Hammers have failed to score in consecutive away Premier League games for the first time since November 2017. Bournemouth striker Callum Wilson has netted six Premier League goals against West Ham in six appearances, more than he has managed against any other side in the competition. Bournemouth's Callum Wilson is only the second player to hit double figures for goals in a single Premier League season for the Cherries (10 goals), following Josh King's haul of 16 in 2016/17. Bournemouth attacker Josh King has scored four and assisted one in his three home Premier League appearances against West Ham. From the very first whistle, Wilson's sharpness gave Bournemouth's attacks a real focal point and the England striker's presence allowed those around him to raise their game after a poor run of form. West Ham, in truth, had done well to nullify his threat inside the box for 53 minutes, but it was a venomous, dipping volley from 20 yards for which this game will be remembered. The strike no doubt put an extra few million on Wilson's price tag, and but for an excellent save from Fabianski, he would have had another. 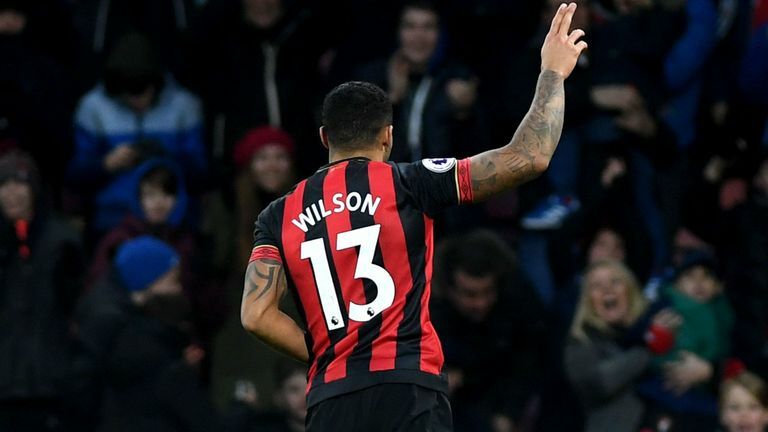 Wilson's worth to Bournemouth simply cannot be measured after another demonstration of why some of the country's biggest clubs are starting to express their interest. Bournemouth host Chelsea at the Vitality Stadium in their next Premier League match on January 30 while West Ham are on FA Cup fourth-round duty at AFC Wimbledon next weekend before travelling to face Wolves on January 29.